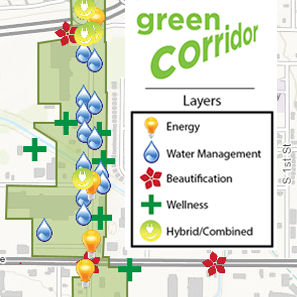 The three-mile stretch of S. 6th St. from W. Howard Ave. south to W. College Ave. was successfully designated the Green Corridor in 2011 by Alderman Terry Witkowski and the Common Council as a bold showcase for sustainability, innovation, and beautification. The Green Corridor includes Business Improvement District #40, and the initiative has attracted the active support of the Garden District Neighborhood Association, the Gateway to Milwaukee, Energy Exchange under the leadership of Bryan Simon of Simon Landscaping, the Office of Environmental Sustainability, several colleges and American Rivers, a national environmental organization partnering with Southeastern Wisconsin Watersheds Trust. S. 6th St and its environs is a highly visible transportation corridor that connects the airport and Amtrak station to all other areas of metro Milwaukee. As a highly visible area, demonstrations of innovations in sustainability would be frequently seen and have a high impact. Serve as a living laboratory to demonstrate green technology and innovation that improves water quality, reduces storm water runoff, saves energy, cleans the air and stimulates business and job growth. Educate businesses and residents about green technology best practices and encourage application in all sectors – public and private, commercial, industrial and residential. Enhance Milwaukee’s image as a sustainability leader and the Garden District as a model for community sustainability. Become an attractive location for growth of green business by demonstrating openness to innovation as a business community and our support of sustainable practices. Support and be inclusive of Aerotropolis Milwaukee.